This is Bill's entry into the Fiestamovement, a call for 100 bloggers to drive and write about their time behind the wheel of the Ford Fiesta as Ford tries to make it the IT car. 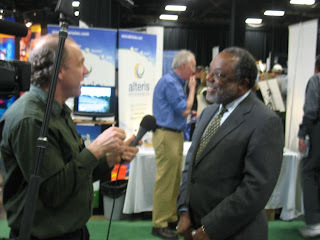 Was at the NESEA (Northeast Sustainable Energy Association) with Now or Never. We were (are) generously hosted by Boston Chapter of NESEA, BASEA if you're a fan of acronyms. It's aka Boston Area Solar Energy Association and they attract a good amount of querries. I know because I needed to let folks know that we were interlopers, not the real solar deal. We were just the press looking for stories of why folks had come to the conference. We met some fascinating people: an energy auditor in Maine, driven by high energy prices; an alternative energy service company; a number of folks in the wind business; and the president of a college. The College President, Mr. Theodore Landsmark, took the opportunity of our live feed to sign a resolution of commitment on climate change at the school he leads, The Boston Architectural College. There's great energy at the Buiding Energy Conference and we'll find more of it today. In Saco, Maine they've connected the train to a station that's "on the grid and off the grid" as it gets power from the wind and the earth. The station's smart design is a source of pride for its community and a service to everybody that passes by, including US Congress member, Chellie Pingree. Developer Bob Martin and architect Mike Lassel tell us of why a facility like the Saco train station is good for all of us.